What a nice weekend to Squat!! The weather has been brilliant here in Cardiff today (for a change! 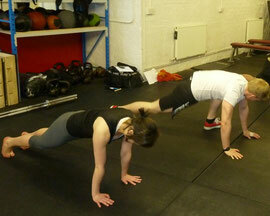 ), what could be better than being inside being taught how to squat on a day like this?! I hope they both enjoyed it and felt that they came away with some useful information and got some good practise. Next workshop is on the Clean and Jerk and will be at Dave’s Gym on Saturday the 26th of May from 9am – 12pm, £40 only so bring a friend and get yourself down and get lifting. Hope to see you there! Don’t forget girls: Strong is the new skinny, Ruth is a living proof of this so don’t be scared to join in! Got an old video to show you how you can do the rear foot elevated squat below.